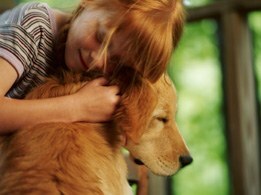 One of the more frequent questions we are asked at K9 Magazine is "what are the best dogs for children?". As many of our regular friends and readers will know, we're pretty much breed agnostic. That is to say we have a genuine fondness for all dog breeds and it's our firmly held belief that any dog, if properly trained, socialised and cared for can be the perfect companion for families with children or without. In this article we won't seek to give you a definitive list of the so-called 'best dogs for children', instead we'll touch on a few of the popular candidates and give an overview of what you should be looking for when selecting the perfect dog to join your family. Dogs and Children - Do They Mix? Just missing out on a medal is the Golden retriever. The concept of dogs and children mixing without trouble has become an alien one to the media recently. With tragic dog attacks involving children sadly becoming more prominent in our media, it is essential that two points are address. The first being that children and dogs can and will get along famously and add value to each other’s lives given the right preparation and approach. Secondly, it is the responsibility of the dog owner to ensure that there dog does not pose a risk to anyone, especially children. Never leave a dog unsupervised with a child. Whether it is for a second, or an hour, whether it is a Yorkshire Terrier or an Anatolian Shepherd, make this mistake and you will be the one to blame if something happens. Picture if you will a young family. 2.4 young kids, a young, lush lawn and a newly furnished semi on the outskirts of town. For the lucky ones reading, this might be reality. Nothing is more rewarding than starting a family, but for those who got down to prolonging the existence of human kind a few years ago, you may notice that your children’s heads are disproportionately large in comparison with their meek, yet flexible bodies. If their heads do look a bit large it could mean that you have toddlers. Great, everyone loves toddlers. Especially this writer, but what he likes to see more than a happy, healthy young family is a happy, healthy young family talking the dog for a walk. It is a scientific fact that the presence of a dog reduces the risk of heart disease, that is of course subject to not smoking sixty fags a day and existing on a diet of lard and fried mars bars. It is also a fact (maybe not scientific) that dogs are the best thing since sliced lard bars. So why not add a canine component to your near perfect home set up? But I sense trepidation among some of you. What if he doesn’t like the kids? What will he do when we are at work and the children are putting the nursery staff through hell? What if he trashes our new pad? Buy a timber wolf and you would have good reason to ask these questions, but take heed of our recommendations for the most suitable dogs for a young family and you won't go far wrong. But remember, your children’s bodies will catch up with their heads by the age of about three and a half. So selecting a dog purely on its suitability to co-habit with young children can be a bit of a red herring. Your aim should be to choose the best dog to share your lifestyle with. There are no shortcuts to training and no matter what breed you do select, no dog comes handily pre-packaged to 'work with children'. It's down to you as the owner to train and properly rear your dog to become a model canine citizen. Universally regarded as a superb family dog, this chap is friendly, he’s easy to train, he is obsessive about his personal hygiene and more handsome than George Clooney and Brad Pitt put together. Labrador Retrievers are generally fairly laid back in a family environment, combining a playful streak with a propensity to sit in quiet contemplation while you lot tuck into dinner, owning one will enable you to maintain an active social life so long as you consider the practical needs of the dog, such as garden breaks and feeding. The Labrador Retriever has the distinct advantage of not requiring a lot of grooming, and therefore not leaving wads of fur everywhere. Couple this with this with his intelligent, affable and obedient nature and you’re onto a sure winner. And let’s not forget that these guys, when they are young, are in fact Andrex puppies, so a ten out of ten for general cuteness as well. A respectable runner up rosette goes to a dog which surely is the pride of many a family. The Staffy has copped a fair bit of bad publicity recently and has done so in the past, but it has to be said that thousands of families nationwide are benefiting from his loyalty and friendliness as we speak. When it comes to Staffies, in the immortal words of Public Enemy 'don't believe the hype'! Staffies are superb family pets and they tend to have a naturally protective disposition toward children. A relatively small dog, who is particularly suited to the smaller house environment, the Staffy fits in to all family set ups well. A short, coarse coat means that the doggy brush will not need de-fleecing every two days and the Dyson will be able to get up the stairs without choking to death. Elegance and a robust personality go hand in hand with the Poodle. But why the Miniature variety? Well, the bigger the Poodle, the less likely he is to be as playful as his smaller cousins, they just tend to be more laid back the bigger they get. The Poodle is a dog that can happily play with children without ever needing to grunt or growl, so laid back in fact that you should not be surprised to see your Poodle serving as an improvised pillow for a snoozing toddler. This Poodle has some outstanding personality bonus points, but then you get to the coat. Short, curly fur sheds less and this makes the breed ideal for people who are looking for a low shedding dog breed and / or people who may be sensitive to dog hairs. A hugely popular dog, with an adorable personality. The Golden Retriever is a dog that looks great, with his shiny thick coat but he also sounds great. He loves a good bark now and then, which can be inconvenient if you have a baby upstairs trying to get some kip. On the plus side, this chap is always up for playing, and is strong enough to withstand a bit of rough and tumble when the kids get a bit older, secretly I think he loves a bit of a wrestle, and he is a gentleman about it too. It is common opinion that this dog is so well behaved and easy to train, that the kids could in fact pick up a few pointers off him. Once again, his long fur has let him down in the perfect pet department, but if you are that mad about Golden Retrievers, you won’t mind a bit of extra vacuuming and will soon find that this lad really is a Super Fury Animal. Perhaps not what one would immediately think of when talking about dogs for young families, but this dog really does take some beating. Not a suitable breed for all young families, but in the right situation this dog is unbeatable. The biggest entrant so far, the GSD really is an ideal companion for a young family provided you have adequate space and sufficient time to get him trained. A boisterous dog is bad enough in any breed, but when they are this size they can be a real handful if they are not properly trained. However, as I am sure fellow GSD lovers will agree, once part of the family, this dog will not be beaten on loyalty, friendliness, obedience and looks. But stuffed away in a small flat on his own, he is a different dog. The GSD requires an experienced hand to guide him towards appropriate family life, but time spent on him in his formative years will reduce the risk of ending up with an aloof, over confident dog later on in life. This is one of the most popular dogs in the UK, so he must be doing something right. However, his suitability as a dog for a young family may not match his popularity with more experienced owners. Dogs this small always run the risk of being trodden on or kicked by clumsy youngsters. Do the same to a GSD and he will hardly notice, but a Yorky could be seriously injured if in the wrong place at the wrong time, perhaps sleeping by a door. Yorkies are easy to train though, which goes someway to explain their huge popularity, and they do love to play, when it suits them. Being a terrier, this little fella may get a bit protective of his owner when guests pop round for tea. But if your one desire is a dog that will curl up on your lap for an afternoon snooze, then look no further, this is the dog for you. But if you want a dog that loves a bit of hands on play then perhaps our next entrant is more up your street. Next we take a look at a breed that has a special place in everyone’s heart at K9 Magazine. The good old Greyhound is not far off being the perfect family dog. But misinformation has resulted in this dog getting a reputation as a bad pet due to his constant need to be exercised, what utter rubbish! The Greyhound needs as much exercise as any other dog his size, he just happens to be a fast runner. Similar to the Staffordshire Bull Terrier, the Greyhound suffers from a totally undeserved image problem. Don't buy in to the myths surrounding this wonderful, affectionate dog breed. But aside from his engine like legs, the Greyhound is a loyal and friendly dog who likes to play to with the kids on a regular basis. For the active family, the Greyhound will really benefit and fit in well. But for the average working family, the Greyhound will find his place just as happily. Combine this with those beautiful big eyes, his short, manageable fur and his affectionate nature, this breed is an absolutely brilliant dog for a young family. Whilst the list above gives you some introductions to the commonly heralded dog breeds who are universally recognised as working well in a family unit, we again urge you to consider that any dog will always be defined by the work, attention and care invested in it by its owner. If anything, in this article we are at pains to advise you that selecting a dog based only its compatibility with children would be an error. There are overriding factors to consider such as your lifestyle, the time you are at home, the amount of hours you can put in to the dog's care, training and socialisation as well as your general preparedness to bring a dog in to your family. One of the very best ways to increase your chances of getting a dog that will be good with children is to adopt one. Dog adoption shelters are experienced and knowledgeable about placing the right dog with the right owners. They tend to have done solid assessments on the dog's in their care and make re-homing recommendations on a dog's suitability based on a number of different criteria factors. Whatever you do, don't discount the adoption route as the best way to acquire a new dog, you'd be making a glaring omission if you did. Rest assured, there are many dogs waiting for new homes in the rescue shelters across the country that would be just perfect for a family with children. Take a look for yourself - dogs for adoption that are good with children.